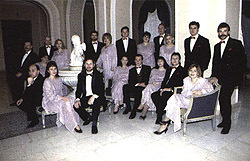 The Kyiv Municipal Chamber choir was founded in December, 1990. 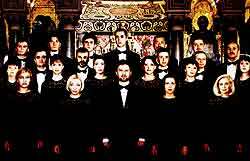 Choir nembers include professional singers, who are graduates of conservatories and musical institutes throughout Ukraine. The Conductor, Mykola Hobdych, graduated from the Kyiv Tchaikovskyi conservatory. The Choir's national and international repertoire includes medieval, renaissance, paroque, classical, romantic and modern music. 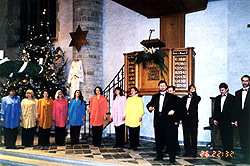 The Kyiv Chamber Choir has performed in the USA, Ireland, Scotland, Wales, England, France, Netherlands, Germany, Denmark, Poland, Belarus, Russia, Ukraine, and numerous international music festivals. The Choir's major awards include three Grand Prix prizes at European choral festivals. Concerts have been recorded and broadcast at BBC Radio-3 and "BBC World" in Great Britain, as well as Germany, Poland, Dutch, Swiss, Finland and Ukraine. The choir has recorded 17 CDs of national and international music.